It's time for our Dot Crazy Blog Hop! Follow along this week as several designers play with Bill Kerr and Weeks Ringle's Dot Crazy collection (and enter for a chance to win some Dot Crazy for yourself!). Today we're featuring a Technique Tuesday post from Bill and Weeks. They're showing how to fussy cut the fantastic Fun & Games print from their new collection. Check out their video (it it you'll see the two quilts they made using fussy-cut Fun & Games fabric, which we'll be sharing as part of the virtual trunk show on Friday). Ready for some Fun & Games? As part of today's blog hop post, leave a comment below letting us know which colorway of Fun & Games you like best (blue, green or strawberry). We'll randomly select one commenter to win 2 yards of the print in their color of choice. Giveaway is open through Friday, December 22nd at 11:59 pm EST. 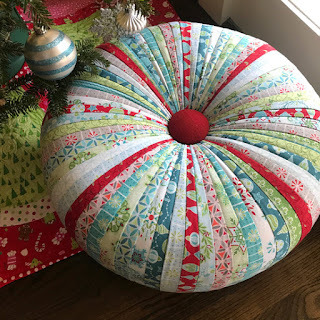 Tuffet Source and Amanda Murphy are giving away Amanda's Nordic Games tuffet to a lucky inner chosen at random (US addresses only because of the cost of shipping such a heavy prize). To enter you go to Amanda's Facebook page and comment on the tuffet post there. I think I'd love the strawberry fabric...think I'd make a new Christmas wall hanging for next year...I'm thinking it would look like poinsettias! Green is always my favorite! Blue is my favorite color but I really want the green. Happy Holidays to you all. What a fun way to use this fabric--my favorite is the blue! Fun & Games is such a great fabric. I'll need to buy all three because my son will like the green, my grand-daughter will adore the pink, and my favorite is the blue! I think I like the green best. Love the way she is cutting the make the dots go in a circle. Green is there any other colour. Blue please to go in my grandson's quilt! I think PINK and warm as I sit here looking at the snow come down in Vancouver B.C. I love all of them! This year our Church is celebrating a Blue Christmas so I could make a memory quilt with the blues. The blue and the teal are wonderful colors. I think I would choose the blue--not an easy though, since they're all very fetching! That video was awesome, as well as the beautiful quilt behind them! I am partial to the blue fabric. Blue would be my first choice,Great tutorial!! Blue is my favorite. This was interesting. Thanks. Great video. I love the strawberry color the best...maybe because I love strawberries!! Strawberry, please! I love Bill and Weeks's Modern Quilt Studio quilt designs and fabrics. Thanks for the great giveaway. All of the colorways are beautiful making it a hard choice. Today I choose green, but ask me again tomorrow and I might change to a different one. I really like them all,but the green colorway is my favorite. Usually I would go for the strawberry, but the green is my favorite in this line! I love strawberry! This is a cute line. I love the blue. Taking a Paula naselstetn vlass and think this might be one of my fabrics!! Love the strawberry ...can see it already in a cute quilt. I love the Strawberry color way. Thanks! I think the Strawberry is especially pretty! The blue!!!! Such fun !!! I will have to choose the Raspberry! Yet, it would be so spectacular to own all three fabric combinations! This is such a fun and fabulous fabric collection. Thank you for sharing it with us and all of the great ideas and tutorials! This is such a FUN collection! I'm a dot lover too and would have loads of fun sewing with the blue colorway...it's that purple ribbon that caught my eye! The blue is really lovely. I teach the stack and whack kaliedescope and love this way of making one! I love the strawberry. All the colors are great. Thanks for the great video and tutorial. I love all those beautiful fabrics. I love them all, so it's hard to choose, but that Strawberry is so nice & bright--think I'll choose it! They are all wonderfully exciting colorways especially looking at the strawberry one being cut up in the video. Blue would be my choice though. More options to use it.